Weeks 18-25: Level editor and finished Terrarium! Wow, it’s been 2 months since I last posted! Time has flown by. But I’ve done a sizable amount of work, and I’m pretty happy with it! The above screenshot is also of the third and final Terrarium level (I’ve started using the level editor to design the levels, of course). The hazard of the Terrarium areas are these small flowers which you can see in the bottom half of the level. These periodically release little spores which float around to the ground gently. Unfortunately for the players, they are highly sensitive – if a player hits a spore, it explodes and kills the player. I think that should be fun! I’m now starting to work on the last area for the game. It’s a foundry/industrial type area, with red as the main color. This will be really completely new stuff, since most of the game up to now has been porting from the old Processing version of the game. I’ve created a lot of systems to help me develop the game, so I’m looking forward to see how they help my process from here on. It’s also come up that end of June is impossible for an actual release, given the amount of work left to do. I will instead be aiming for an alpha at the beginning of week 29 (mid-July). Then I’ll proceed to testing the game thoroughly in order to find and fix bugs. 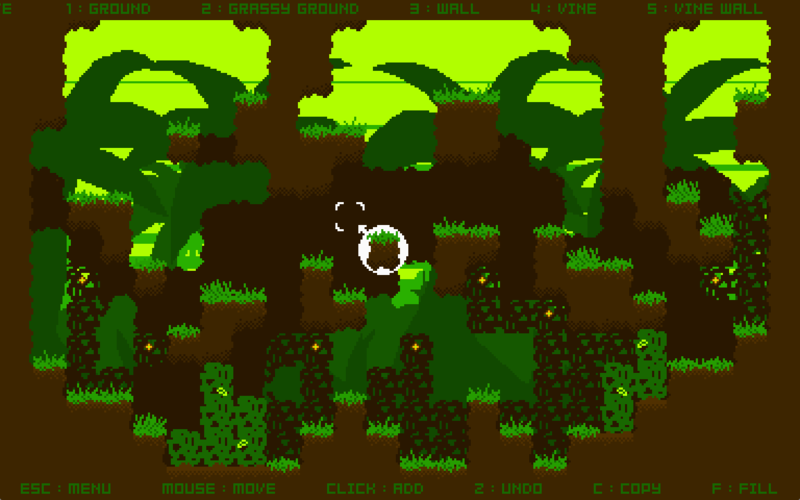 I’ll also be improving graphics and composing music for the Terrarium, Foundry, and Editor. So in the end, I’m aiming for release in end of July. Wish me luck and good work!